"Let's Claim the Moon for the U.S. - Now!" by Pierre J. Huss, Mechanix Illustrated, February 1957. 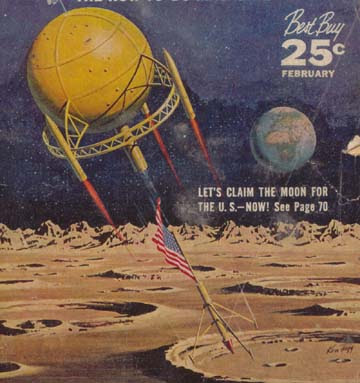 Sharp-eared listeners will note that your humble host, who performs the dramatic reading, managed to throw in a sci-fi element by reading the headline as "Let's Claim the U.S. for the Moon." Not sure why moon beings would want to annex a piece of earthly real estate, but there you have it. "Ingrian Polka - Kuppari Eeva," Off to California. Yes, the reason the title isn't mentioned on the show is I wasn't sure how to pronounce it!